You can now test the first release candidate of the upcoming 1.4 release! The most apparent change should be stability. We have tried to take care of lots of bugs that caused frequent crashes and corrupt pads in the past. Still, a few new features have made it in, such as support for recording metrics. Other new features are mostly under the hood to make the lives of admins and plugin developers easier. For details refer to the preliminary list of changes. If you want to test this release, fetch the latest changes from github and checkout tag “1.4.0-rc1”. A list of things that need testing is available on the following pad. Please report your findings on github (or drop us a note on the pad). Also, if you have successfully tested an item on the list, please add a note there, too. Ouch. As you have probably noticed, the last release had a painful bug in it — we had accidentally switched two lines, which lead to really bad performance on production instances. NEW: We now follow the semantic versioning scheme! NEW: Localisation updates from http://translatewiki.net. Don’t hesitate, git pull today! And as always: spread the word, share the love! turns out we haven’t kept our promise: Contrary to previous statements this is not v1.3, as you may have noticed. Development velocity has seen a slight drop in the past moths, as people have been busy with other stuff. As always, if you like etherpad why not pitch in and help push etherpad to the next level! We have ambitious plans! Git pull today, and happy collaborating! 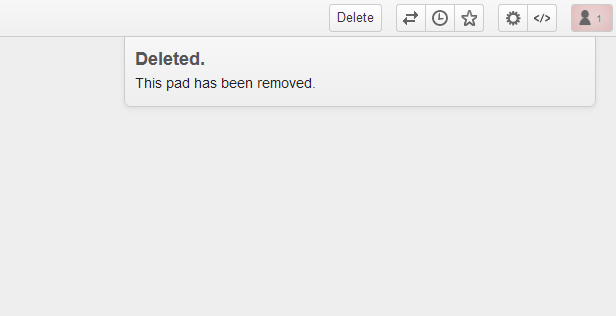 Sometimes, when you really care about disk space, or when your pad contents are extremely confidential or private, you might want to simply delete your whole pad, since people could still access your sensible content via the timeslider. And if there’s a need, there’s also a plugin. ep_push2delete allows you to press one simple button and delete your pad. With all its contents and all its history of changes. Nice and clean. Without a trace. Grab ep_push2delete from your /admin/plugins page. we have recently received the results of a security audit performed by Mozilla and have since sought to close the biggest gaping loopholes. The result of this effort is version 1.2.9 of Etherpad lite, which is probably the most secure version released so far. I’d also like to thank Sebastian Nerz for reporting a massive security issue last week.